FoodSoftware.com specializes in business plan and startup products for restaurants and offers a variety of restaurant business plan and new restaurant start products. Products in our restaurant business plan category are software and/or books which are specifically designed for restaurants and related hospitality and food retail operations. Most of the products in this group are for creating formal and comprehensive business plan presentations to investors or banks to raise money or for evaluating business ideas for your own purposes. Other products in this group are to support your evaluations (how much money do I need to start this new restaurant?) or educate you (what do I need to learn before I buy a restaurant?). Though many of our products are restaurant industry standards, they are still very specialized and not found in any retail store. Formats: Products are available as books only, books with CDs and files for download delivery only. Overall Content: Most business plan products include business background information, general plan instructions, plan examples and customizable templates for presentation documents and financial spreadsheets. File Content: CDs and downloads usually contain a variety of files: PDFs for documentation, Word documents (.doc, .txt or .rtf) for customizable documents and Excel spreadsheets for customizable financial calculations. Raising Money: Most products in this group are for creating formal and comprehensive business plan presentations to investors or banks to raise money. In addition to doing financial projections, formal business plans also help you demonstrate your professional knowledge by including industry and demographic studies to support your forecasts and operations manuals to show your preparedness to operate a business. Your Own Evaluation: If you are investing your own money, it is just as important to evaluate your business ideas or prospective business purchases for yourself as though you were trying to raise money from others. The most important features of these products for your purposes are spreadsheets for making five-year financial projections and determining startup requirements. Your Education: Some of the products in this group are for learning what you need to know to buy, build and operate restaurants if you've never been in the business before. Comprehensiveness: Business plan products vary in completeness and quality. As you might expect, the less expensive products (under $100) are more basic. The better products are $100 to $200. Product Support: The better products (such as the QuickPlan line) are backed by knowledgeable support staff- people you can get on the phone to ask for help, advice and custom work. Click on the links below for detailed information about our key restaurant business plan and new restaurant startup products. QuickPlan Restaurant Business Plan Writing Software helps you create restaurant business plans if you are starting a new restaurant, looking for money to expand or appraising your restaurant to sell it. Based on a 166-seat full-service restaurant but appropriate for most restaurant types. The Restaurant Startup & Feasibility Model Spreadsheet Software helps you to determine the financial feasibility of new restaurant projects, whether your first restaurant or new location in a chain. 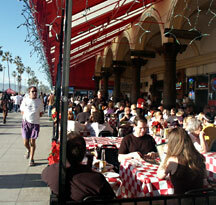 Evaluate the financial feasibility of a proposed restaurant. Also a valuable tool in selling your project to potential partners, lenders and investors. Excel (.xls) file format with a fully functional, completed worksheet and a blank worksheet with no values. Use this product to create sharp looking professional menus. Almost nothing is more powerful for selling a new restaurant concept than showing an outstanding menu for an as-if-existing restaurant. SoftCafe MenuPro� is the world's leading menu design software. Quickly create your own beautiful color menus at a fraction of the cost of print shop menus. Create quick professional designs without the expense or hassle of using a graphic artist or desktop publisher. Quickly make menu and price changes and print your revised menus in-house as fast as needed. No computer training or word processing software required. Easily delegate small edit tasks to inexperienced users. Vastly easier than using word processing or page layout software for restaurant menu design. Includes more than 150 style templates that eliminate the need to design menus from scratch. Makes daily special menus, dinner menus, wine lists, table tents, etc. in any size or layout. Includes more than 1500 food illustrations, over 140 specialty fonts and culinary spell checker. Downloadable for immediate and free delivery. Engineer your menu mix and know your food costs ahead of opening with this product. 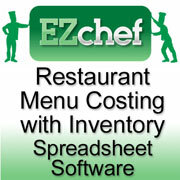 EZChefSOFTWARE� Inventory Management, Menu Costing and Analysis for Restaurants & Bars is our most popular simplified, Excel-based, basic inventory, recipe costing and sales analysis software. Powerful, yet intuitive and easy to use. Helps you save time, increase profits and learn to sell those menu items that make you the most money. Easily manages basic food and beverage inventory tasks and processes. Performs menu costing for every item on the menu (including subrecipes). Spreadsheet-based software (requires Excel to open and familiarity with Excel to operate). Recipe Management and Publishing Software for capturing, storing, finding, sharing and printing recipes. 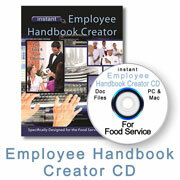 Easy and quick way to develop your own employee handbook rather than to start from scratch. Consists of word processing files for more than one hundred policies and forms that you can edit as needed. Establish and communicate your employee policies to help protect yourself legally and reduce your exposure to lawsuits, litigation and disputes. Organize all of your policies and benefits in one booklet. Allow more effective and consistent management. Increase employee morale, reduce turnover and increase productivity. Each file is duplicated in English, Spanish and Chinese so you can create multilingual handbooks as needed. Contentware requires word processing software to edit or print. The word processing files are in both MS Word (.doc) and text (.txt) formats for use with any word processor in Windows or on Macs. 18 items found searching fields. QuickPlan� Delicatessen Restaurant Business Plan Software rapidly develops business plans you can take to the bank. Whether you are starting your deli restaurant, looking for expansion capital to open your next or want to sell your multi-unit chain, with QuickPlan, all you have to do is edit and fill in the details of an already w... more. 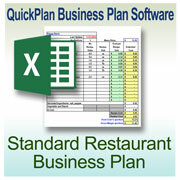 QuickPlan� Diner Business Plan Software rapidly develops business plans you can take to the bank. Whether you are starting your diner, looking for expansion capital to open your next or want to sell your multi-unit chain, with QuickPlan, all you have to do is edit and fill in the details of an already written and organized busines... more.